Before you begin reading, prepare children for what they will be working on that day. Set the teaching point by telling the children why you have called them together, what they will be learning and how it will help them as readers. What you do before reading will change a bit depending on the level of your readers and if you are introducing a new book or continuing a book that you’ve already begun. Consider the needs of all the children in the group. Think about how you can support your language learners to make sense of the text. You can help them by connecting language and ideas to other books they’ve read with similar topics, themes, and purposes. Just remember to keep this time short and to the point. 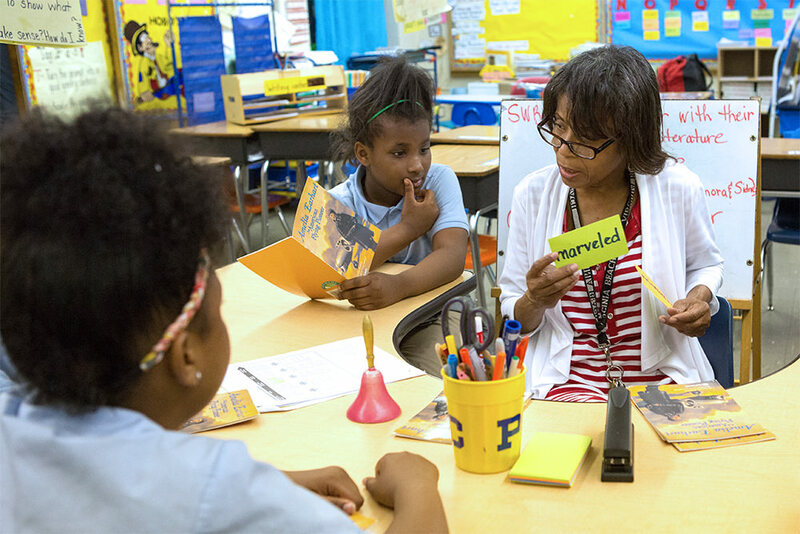 Most of your Guided Reading time should be devoted to the good stuff – the actual reading! Think about both the length and depth of what you will say to children to introduce the text. What amount of background knowledge do your readers actually need for this particular text? Identify parts of the text that might be tricky for your English language learners. Introduce them to tricky sentence structures, figurative and idiomatic language, and new vocabulary. Keep in mind that children need opportunities to do the work on their own with the book. Remember the ultimate goal is to provide them with just enough information that they will be able to tackle the text without frustration, but still read it and encounter some challenges. Plan exactly what you will say or ask. Decide if you will tell children the background information they need, or ask them questions. In other words, are you accessing their background, just providing background, or a mix of both? Keep your introduction brief. You want to get the children reading as quickly as possible. The bulk of Guided Reading time should be spent with you supporting readers during reading. You may spend a little time helping children with features of the text that might be particularly challenging such as unknown sight words, vocabulary, or proper names. But don’t strip away all the challenges. You want to give the least amount of support you can in order for the children in the group to be successful. What you do in a text introduction depends on the text itself and your children’s experiences with similar structures and content. You may or may not need to access background knowledge depending on how familiar children are with the content. Book introductions will vary based on the group’s reading stage. Emergent readers need a more thorough book introduction while the more advanced reading stages will only need minimal introductions. Introduce the book you will be reading to the children. A good book introduction will get children interested in reading the book and help them build or access the background knowledge needed to understand the book. Your introduction will be different depending on the reading stage of the children in the group. Follow the guidelines below for some ideas for an effective book introduction. Do a thorough picture walk. Lead children as they look carefully at each picture. Model for children how to describe the first page and then ask them to describe the other pictures. Use some of the exact words that are in the book. Teach children the repeating language pattern in the book. Do a detailed introduction, but not a thorough picture walk. Start by telling children who is in the book and give a quick description of the problem. Ask children to look at the pictures and begin thinking about how the story will go. You may discuss some of the pages as a group, but you don’t need to use the exact language in the book. Introduce unfamiliar vocabulary, sight words, and any unfamiliar concepts. Preview any tricky words that are difficult to decode if children won’t be able to figure them out on their own. Do a shorter, more focused introduction. Invite children to preview the text on their own. Introduce text structures and text features that are new and unfamiliar to the readers. Briefly teach new vocabulary or tricky language structures. Introduce words that children won’t be able to decode on their own. Only a minimal introduction is necessary to refine and internalize reading strategies. Invite children to preview the text on their own and then make predictions. You may draw attention to unfamiliar text structures or features or tricky vocabulary and language. Right before children begin reading, briefly demonstrate the skill or strategy you want children to try. You can model, explain, or think aloud as you teach the behavior. “Sometimes, authors tell you that they are introducing an important vocabulary word by putting the word in bold. Today, I want to show you what to do if you see a word in bold. You are going to stop, ask yourself, ‘Can I figure out what this word means?’ and, if the answer is ‘no’, look it up in the glossary. Let me show you how I do this…” “Look at this word in bold in the middle of the page. It says ‘African bush elephants live on the savannas.’ I know savanna is an important vocabulary word because the author put it in bold. And I know there will be a definition in the glossary. Let’s look this up to see if it helps us picture what a savanna is. Let’s all look in the glossary… ‘Flat, hot lands covered with grass and few trees.’ I’m glad we looked it up! That is very different from the jungle the African forest elephants live in. As you are reading today, look out for bold words. Use the glossary if you are not sure what the word means, or if you want more information.